awards awardstags Quintet of Radiance Award! No one actually knows who started the concept of awarding fellow bloggers in blog-sphere. It used to rain awards for my blog during those days. I used to love it during the early years of blogging especially the glorious 2007's and 08's when I was new to blogging and fellow bloggers show their affection for your blogs by bestowing you with certain kind of awards. Some bloggers prefer to flaunt the logo's on their blog while some chose to remain silent. Those days used to be fun. Today after ages a wise blogger has decided to shower the Quintet of Radiance award upon the Solitary Writer. Thanks to my dearest Juhi of ShitZooo. I take this opportunity to thank Juhi and of course I will accept this award. But before that I would like to say few words about Juhi. Juhi is a talented young blogger who often reminds me of the young Solitary Writer. She writes good blog posts. I should admit that I have not been a regular reader of her blogs but whenever I get a chance I do visit her blog as a silent reader. Do not kill me for this, Juhi! And you know how much I hate commenting ;) I want to tell you today that - you are a fabulous blogger and you have a long way to go if you have this passion for writing intact.! Guys - Watch out for this talented girl in blog-world. I think I have already completed points 1 and 2, so moving ahead to the description bit. N - Nix's Best friend! z - Zimbly the best! Okay, now that's not written by me. It was written by one of my friend called Nikita to describe me as a part of an Orkut Testimonial. I was recently saving my Orkut Testimonials and came across this. Now its nomination time. I nominate the following fabulous bloggers. PS - I generally do not do award posts these days. I am glad that I wrote this post which actually made me nostalgic. 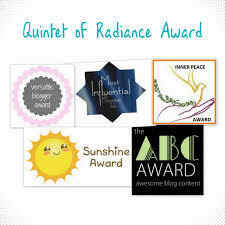 Quintet of Radiance is an award given to recognize good blogs and their fabulous bloggers. Stephen!! Thank you so much! So sweet of you to remember me and my blog!